Just the Facts: by George Mann. 336 p. Published July 2009 by Tor Books. Purchased eBook through Amazon.com because my book club picked it for June’s selection. 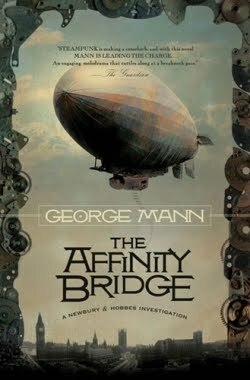 Short Bio: The first “Newbury and Hobbes Investigation” book finds agents for Queen Victoria, Sir Maurice Newbury and Miss Veronica Hobbes, in Industrial Age England trying to discover the mysterious circumstances behind the crash of the airship Lady Armitage. As Newbury and Hobbes investigate the crash scene and airship company, they are drawn into the interesting world of clockwork men, the seemingly unrelated serial killings of “The Glowing Policeman”, and (of course) the underlying spread of the zombie-creating plague. Eyewitness Account: Seriously, a ZOMBIE STEAMPUNK novel? What a way to mash genres! I have to give kudos to Mann for pulling it off way more convincingly than I expected an author could. Unfortunately, that was what he did best in this novel – mesh together the automaton and zombie plots in a rather clever way. The actual writing style and character development suffered so much that I struggled to get to the rewarding climax of the book. Newbury was a poor carbon copy of Sherlock Holmes (replacing an opium addiction with laudanum), and Hobbes was a confusing feminist character who held oddly modern suffrage ideas while concurrently distrusting progress and technology. I would have liked to see them developed more dynamically than serve to mirror past literary characters – and perhaps Mann will have the opportunity to do that in future installments of the series. I must also admit skimming through the drawn out fight/chase scenes that really befit a movie more than a book and wondering what purpose the Jack Coulthard plot served at all – any enlightment on that front would be more than appreciated! If you’re really into Steampunk, Sherlock Holmes mysteries, or anything with zombies in it, then you’ll probably enjoy this book; it has a twist that’s well worth wading through the rest of the book for. This entry was posted on June 20, 2011 by brittneykp. It was filed under 3-Star Books, Action/Adventure, Historical, Mystery & Suspense, Steampunk and was tagged with automatons, Clockwork, Dirigibles, Mental Illness, Missing Persons, Murder, Plague, Serial Killer, steampunk, Victorian England, Zombie.